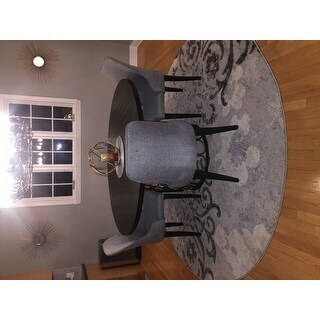 This table is gorgeous and I paired it with similar chairs however in lighter color as I wanted it to blend with my decor. 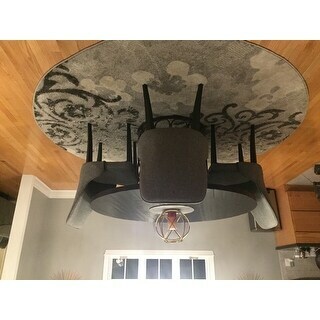 Only problem with the table was that the wood was not properly marked for assembly so we had to rotate and play with it until we got it to match up. If it was marked assembly would have been 2 mins! Dimensions 55.0 In. X 55.0 In. X 30.0 In. I like the design of the table; however, there were visible cracks on its side. I brought it to the attention of Overstock and was told they'd get back to me about it. It's been over two weeks and no one has contacted me. So disappointed in Customer Service! "is the wood top black or brown?" The wood top is black.